It's just about pumpkin season where I live. Warm orange and browns; bold yellows and golds. The colors of autumn. 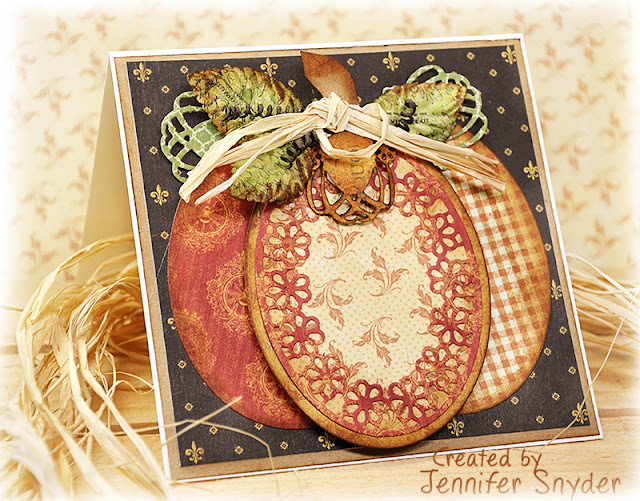 I love making pumpkin shapes. Such a simple shape and yet so captivating. I have a simple DIY tutorial sharing how I turned the fabulous Spellbinders Designer Series -Venise Lace Victoriana Crest by Becca Feeken into a gorgeous pumpkin. Quite a versatile die in my opinion. I'm obsessed with this particular die. I've used this die recently on a different card and just adore the die so I am using it some more since it puts a smile on my face. And isn't that what crafting is all about? Step 1. 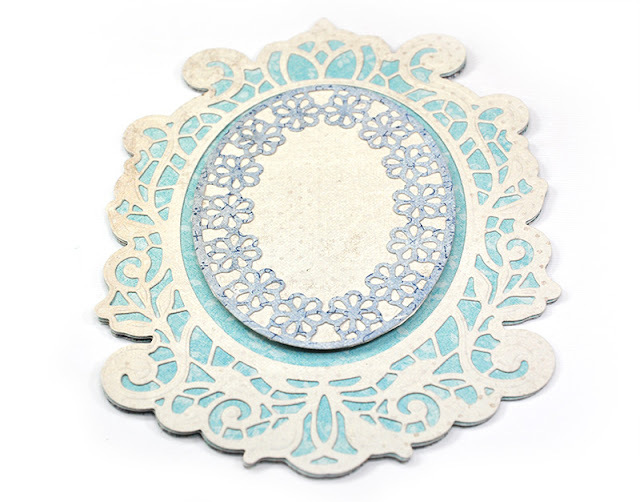 Cut 3 ovals, 1 decorative oval, and some medallions using Spellbinders Designer Series -Venise Lace Victoriana Crest by Becca Feeken. Ink the edges for shading if desired. Step 2. Position two ovals onto the card on a bit of a tilt. Step 3. Add foam dots or dimensional tape to the back of the third oval if you prefer - or keep it flat for easy mailing! Step 4. 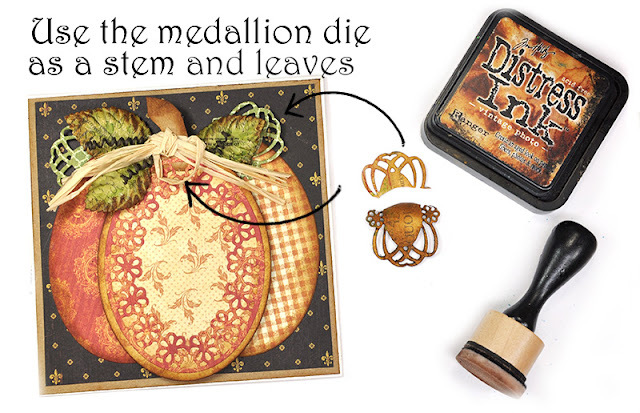 Add the medallion dies to the pumpkin for leafy greens and a decorative stem. See how simple? And yet you will make someone smile when they receive your heartwarming, thoughtful, HANDMADE card. 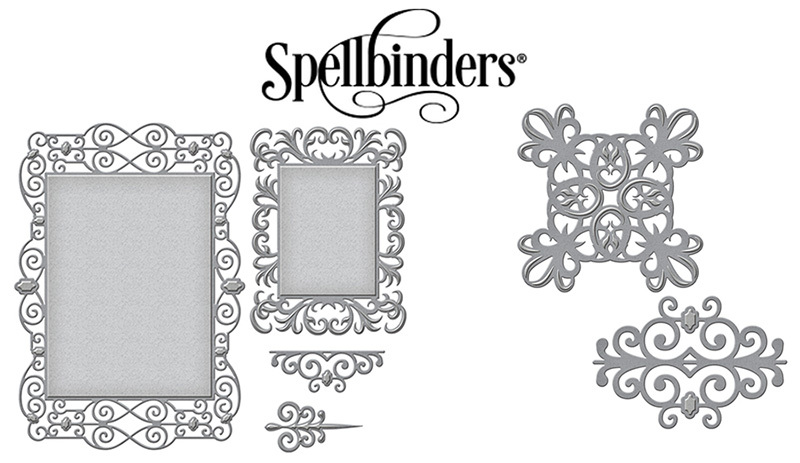 You can shop for all your Spellbinders dies here. They have amazing sales and frequently have BOGO (buy one -get one)sales too! 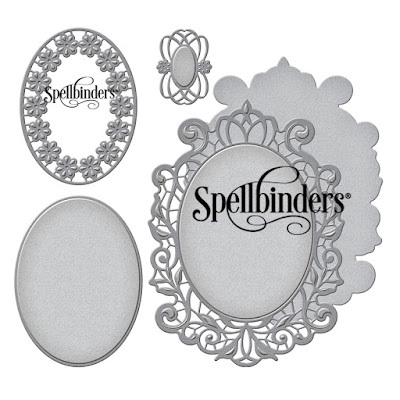 I love being part of the Spellblogger Team. 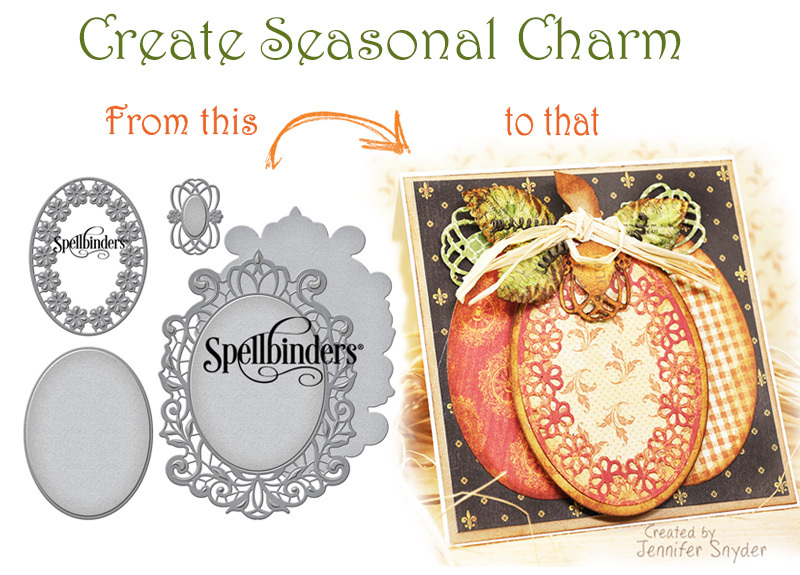 Tired of your basic rectangular card shape? Looking for a change? Need a unique card for someone extra special? If so, then this is the perfect place to stop for a super simple card making DIY tutorial. I'm really bored of making rectangle or square cards. 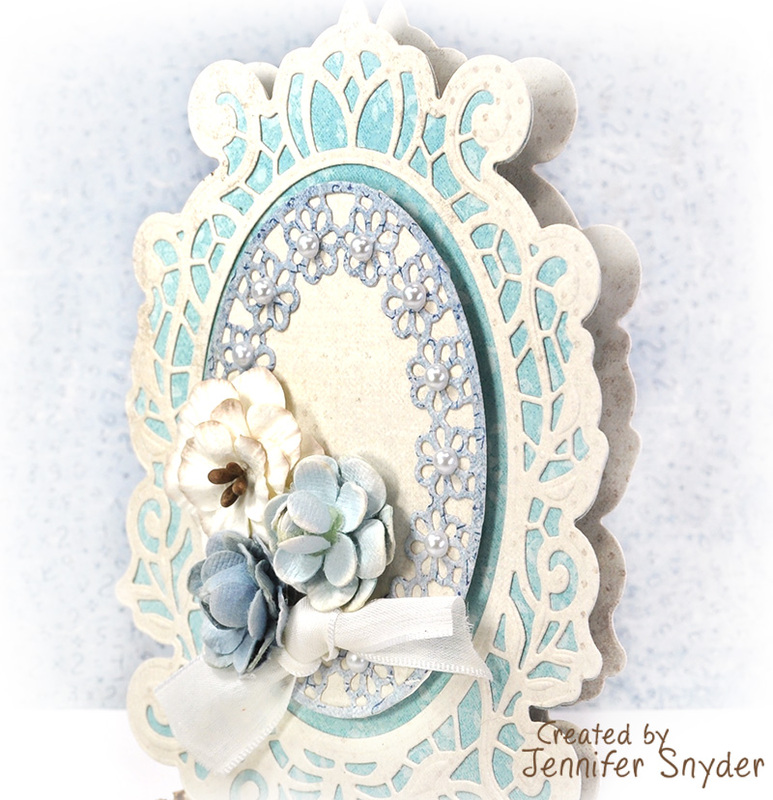 I need to change things up and add shape to my cardmaking life. I have some incredible Spellbinders dies and head turning paper from Maja Design that will help make this project perfect. 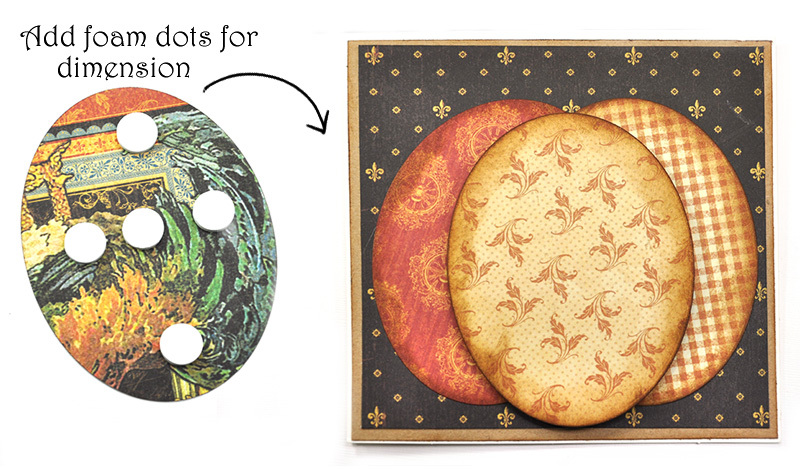 Along with my DIY tutorial, I also have a give-away opportunity to win the new Maja Design paper collection. Keep on reading to see both the tutorial and to see how to enter the drawing. First up - a little about the products I selected. 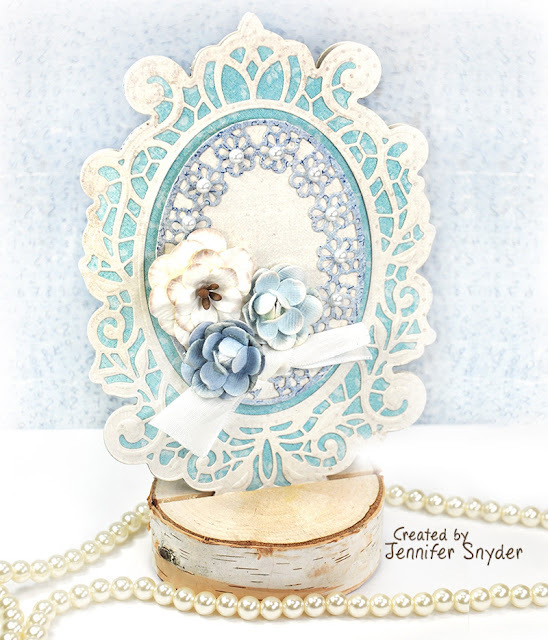 I'm using the Maja Design - Denim & Friends paper collection along with a Spellbinders die, Spellbinders Designer Series -Venise Lace Victoriana Crest by Becca Feeken, as my inspiration. 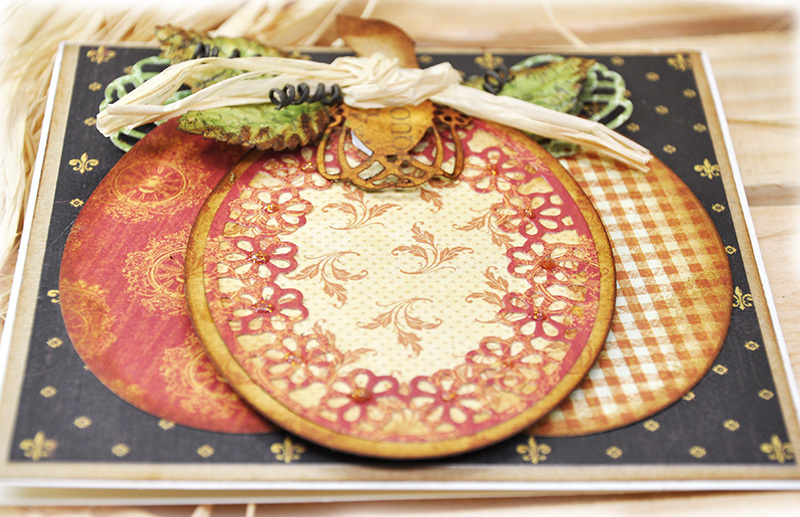 I've already shared an image of the paper collection. 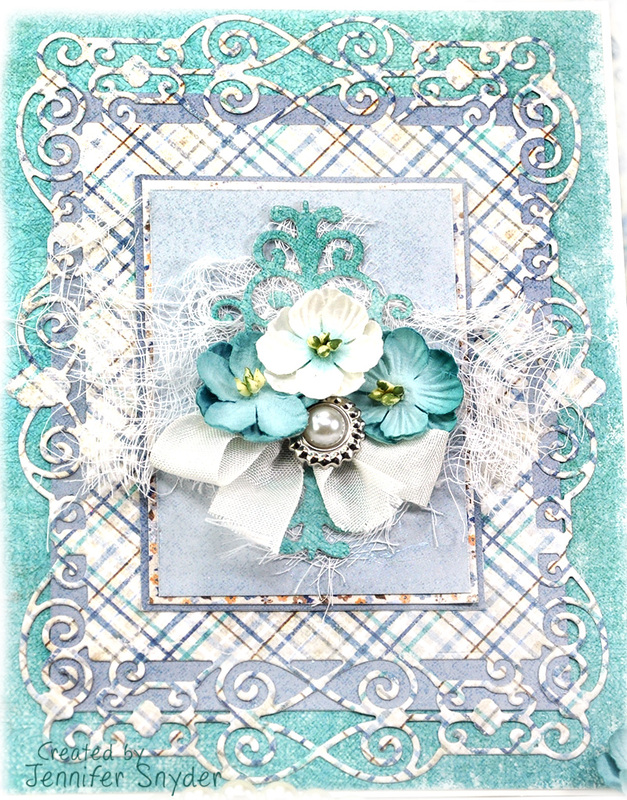 This is the gorgeous die I used for the card. Yep go ahead and add it to your "wish list". Step 1. 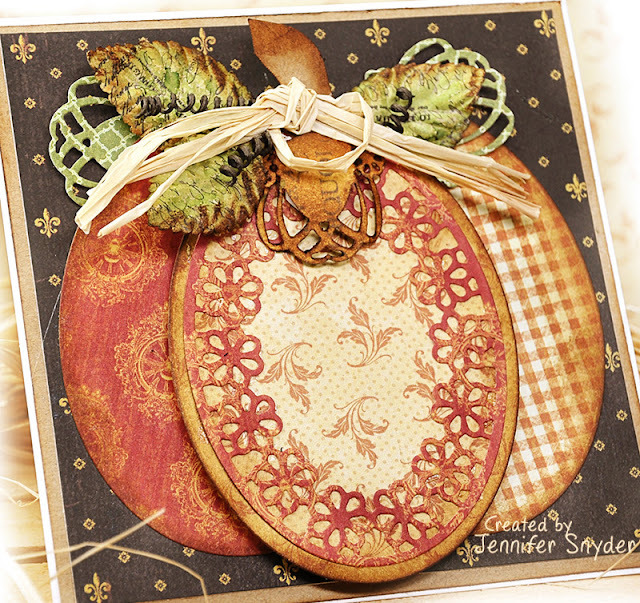 Using a 12x12 sheet from Maja Design - Denim & Friends, grab a die that will make a nice card shape. I chose a die that was quite large to make a sizable card. 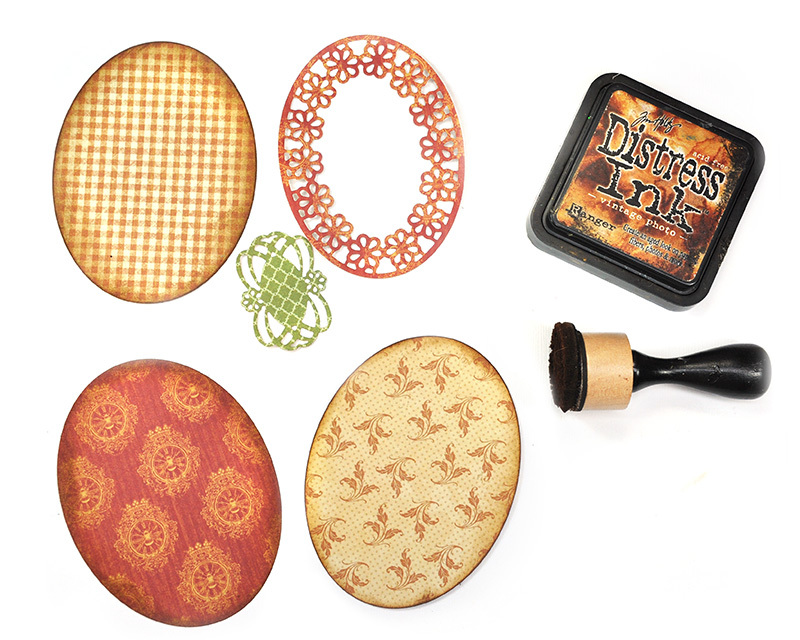 My paper choice is Jeans & T-Shirt from Denim & Friends, and the die is Spellbinders Designer Series -Venise Lace Victoriana Crest by Becca Feeken . 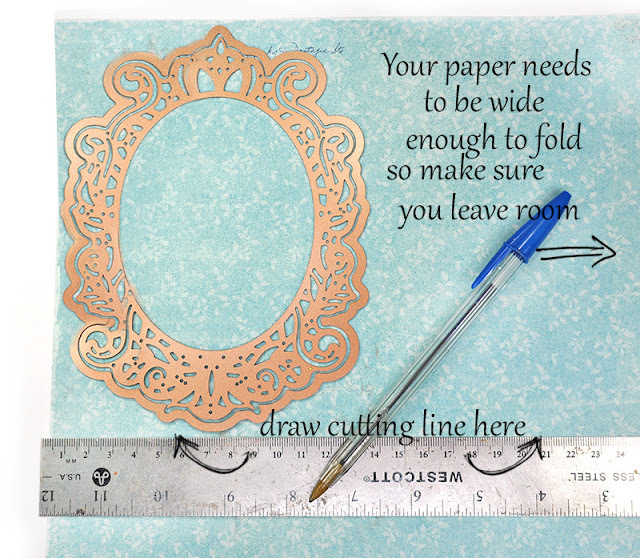 First, decide how much paper you need and where to cut your paper. Your paper must be wide enough to fold - meaning you will be die cutting two layers at the same time. Leave enough width to the right on your paper. Place the die on the paper and draw a line to mark how long the die is and where you need to cut and where you will fold. This step is important. Step 2. 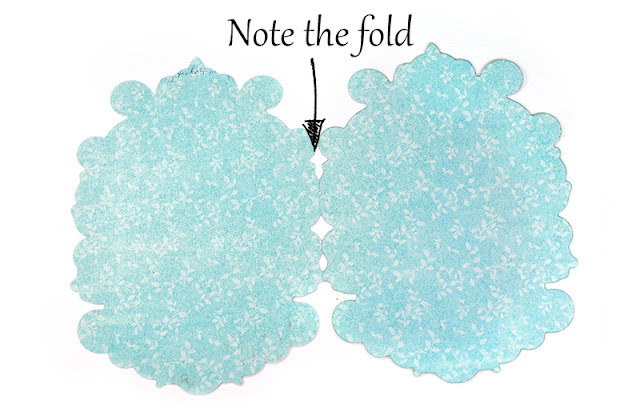 After cutting the length of paper to fit the die shape, fold the paper. 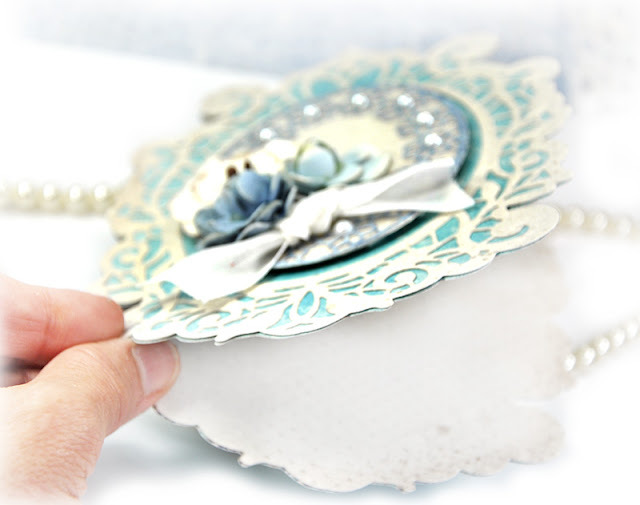 The die needs to hang over the edge of the paper fold slightly in order to create a card that will open without falling apart into two sections. Once your die is in place, secure with tape and run the folded paper/die through your die cutter. Step 3. When you open your card, it should be connected at the fold. If it is, Great job! If it falls apart into two pieces, it just means you probably did not let the die hang over the edge of the fold quite enough. Just try again and move the die over a bit more. 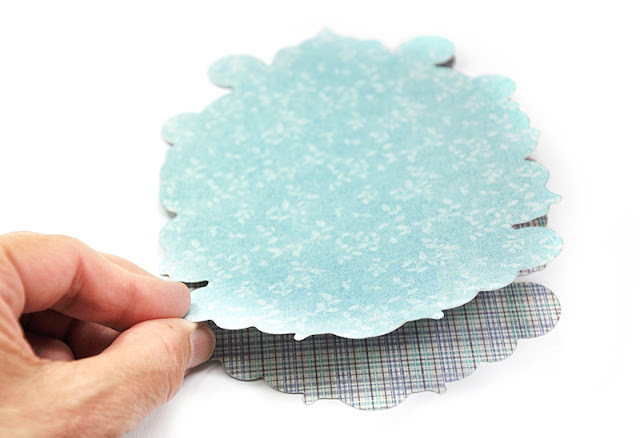 Handy suggestion...try this technique first on a yucky sheet of paper and not your gorgeous Maja Design papers. Step 4. 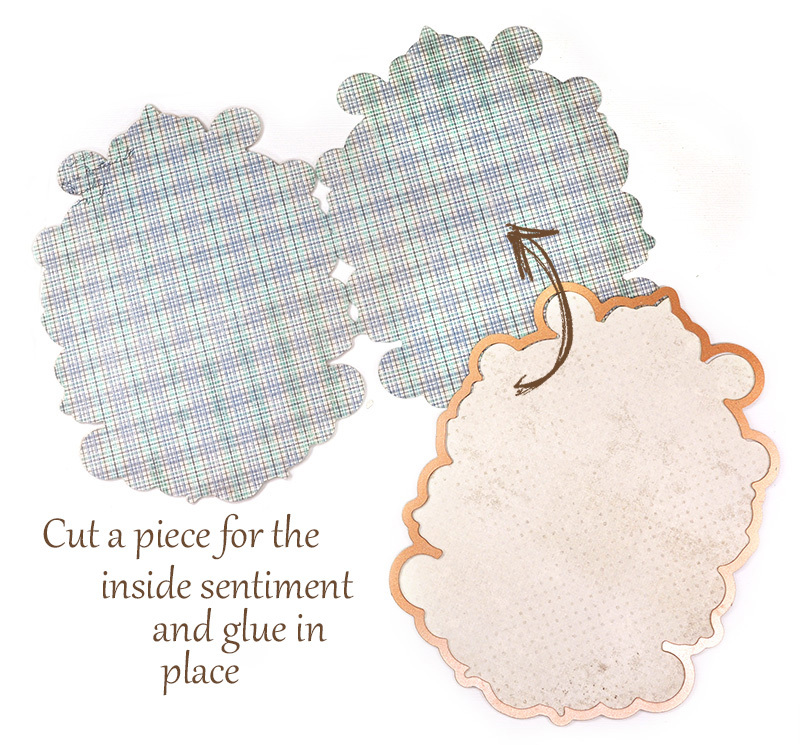 The image below is what you should have if the die cutting has been successful. Step 5. When I opened the card, there was too much pattern for writing a sentiment. I cut a separate die to glue on the inside. Step 6. Decorate as desired. I added another die cut from Spellbinders Designer Series -Venise Lace Victoriana Crest by Becca Feeken .to the center of my piece using foam dots (cardboard, foam tape) for dimension as you can see in the image below. 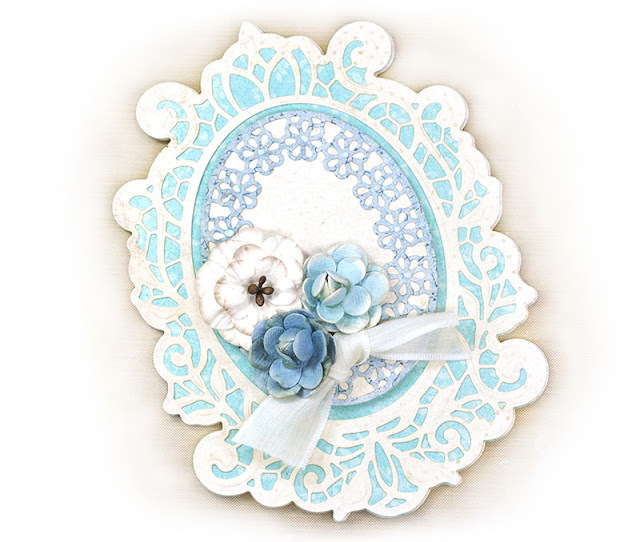 These are paper flowers from Petaloo by Floracraft -Petaloo by Floracraft : Darjeeling collection flowers Mini Garden Rosettes in Blue . You can shop for them right here or shop for them here. Petaloo by Floracraft flowers - Darjeeling collection - Teastained Dahlias in Cream 1467-105 or find them here. 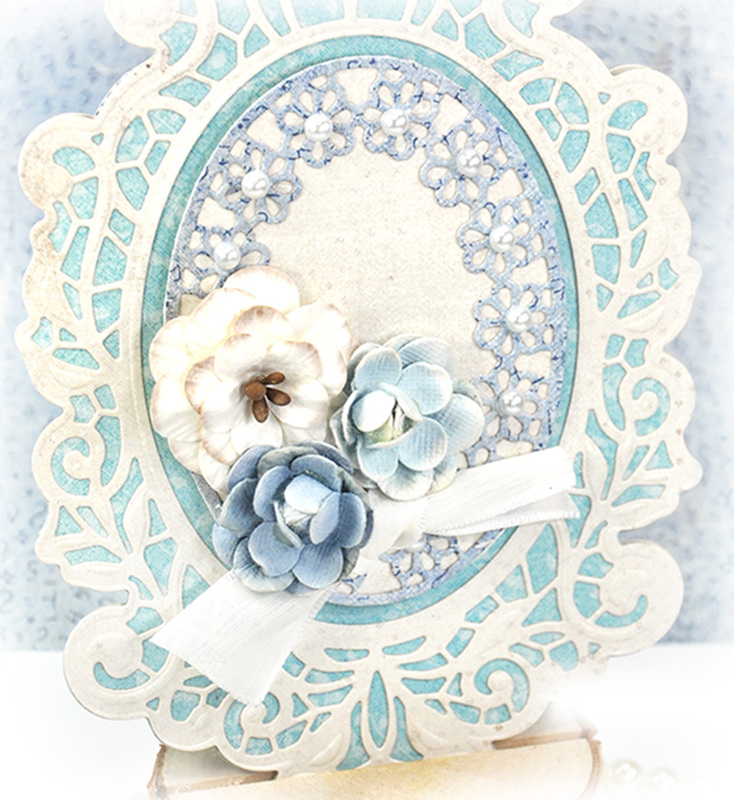 And that's all there is to creating a unique and graceful card that is NOT traditionally shaped. Ahhhhh makes my heart happy and my creative spirit dance. 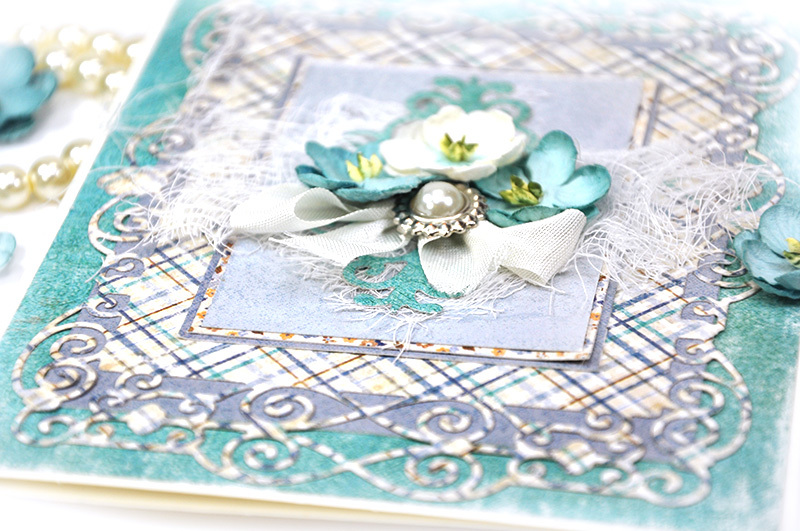 Would you like to win a set of your very own Denim & Friends paper from Maja Design? All you have to do is leave a comment on this blog page. This raffle is open for the month of August and I'll pick a winner on Sept 1st. 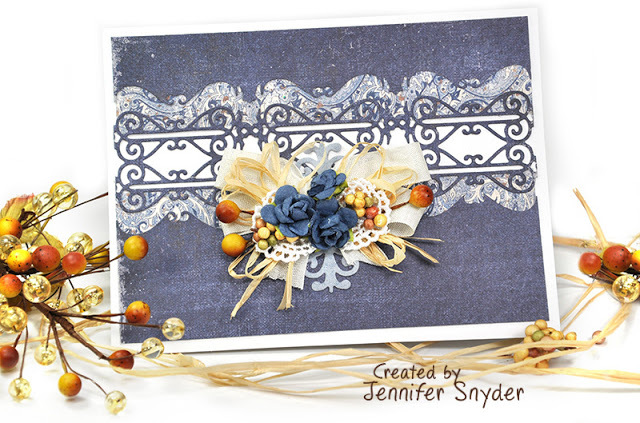 - Checking out my other projects on the blog, created using Denim & Friends. You can find them right here. - visit my Facebook page and leave a comment. Thanks for your time today. I value your visit. You can shop for Maja Design products here. Win a Denim & friends Collection from Maja Design! 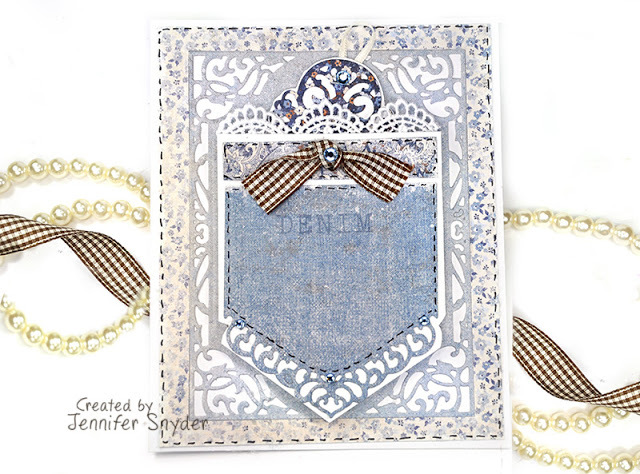 Maja Design has a gorgeous new collection called, Denim & Friends . The patterns are playful and sweet. The paper quality is luxurious. And it's a total "must have" - so why not try your hand at winning a full collection, right? Scroll down to see how to enter for your chance to win. This post can be found here - with full supplies list. 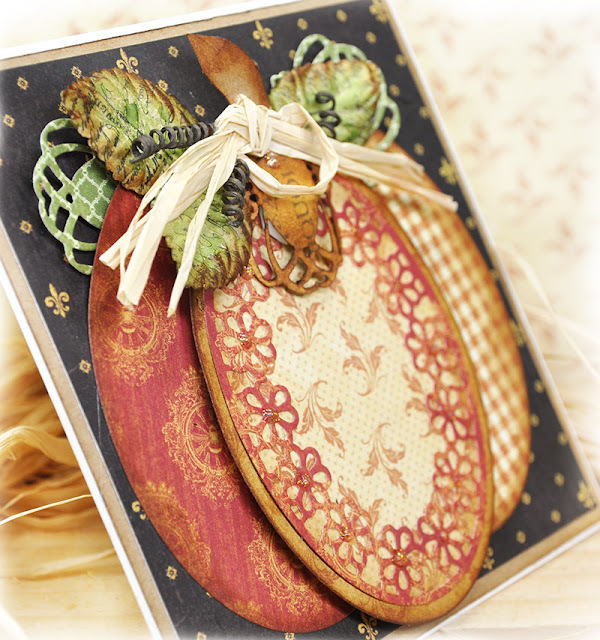 This card with photos and supply list can be found here. 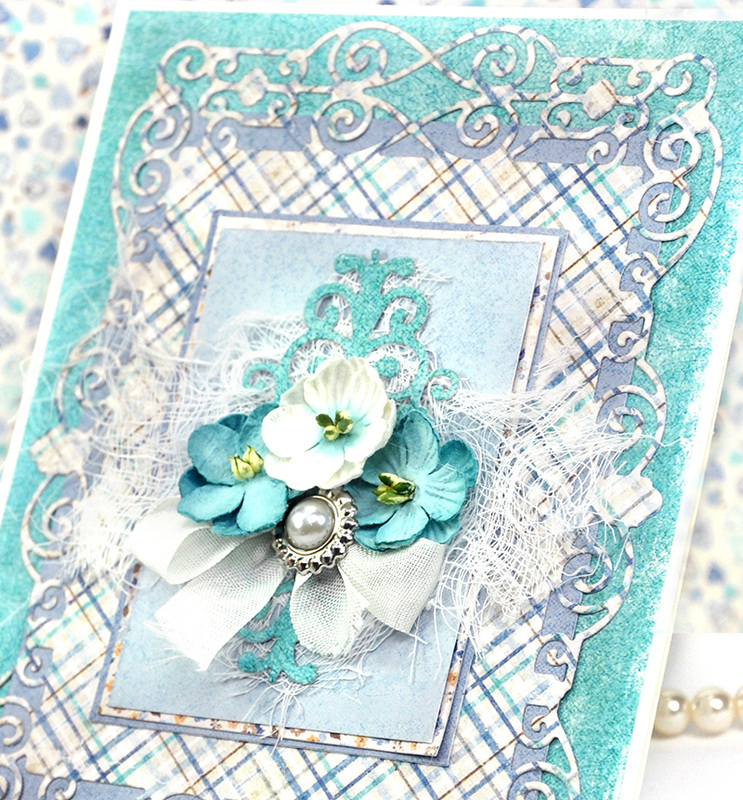 Full DIY tutorial for this card can be found here, along with supply list. This card, along with product list, can be found here. All you have to do is leave a comment on this blog page or any of the blog pages linked above. This raffle is open for the month of August and I'll pick a winner on Sept 1st. I'm in a blue mood. Yep, I've got the denim blues. 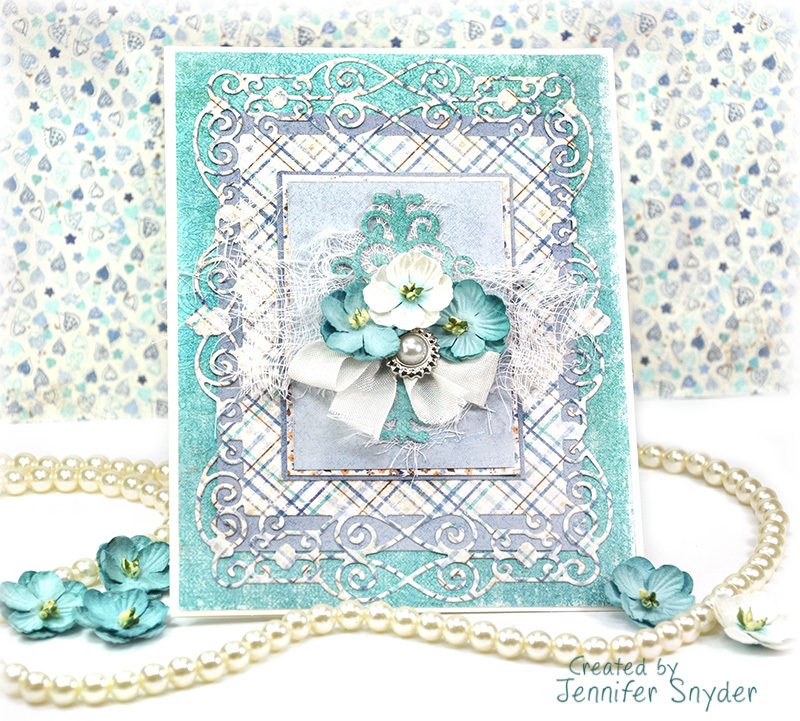 In this case, the blues are great to have especially when they involve the newest paper collection from Maja Design and the newest die release from Spellbinders. It's enough to chase the blues away from anyone, but in this case I'm loving my blue mood. Can I talk about my blue mood? 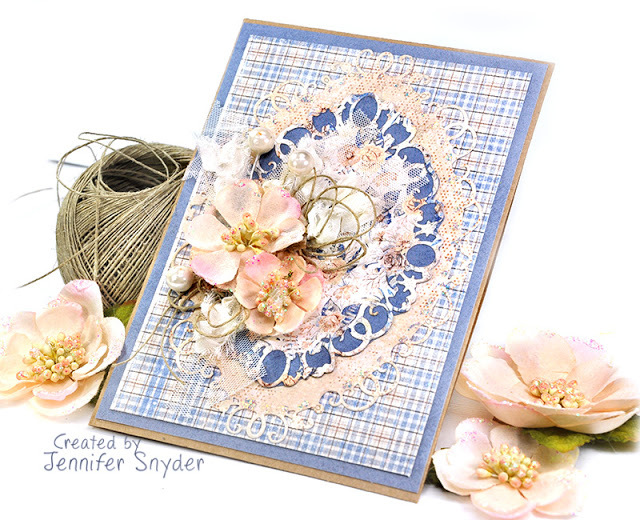 It's caused by a new collection from Maja Design called, Denim & Friends and the coordinating set of solids called Maja Design - Monochrome Collection Shades of Denim & Friends . Gorgeous rich blue color ranges guaranteed to make anyone smile. 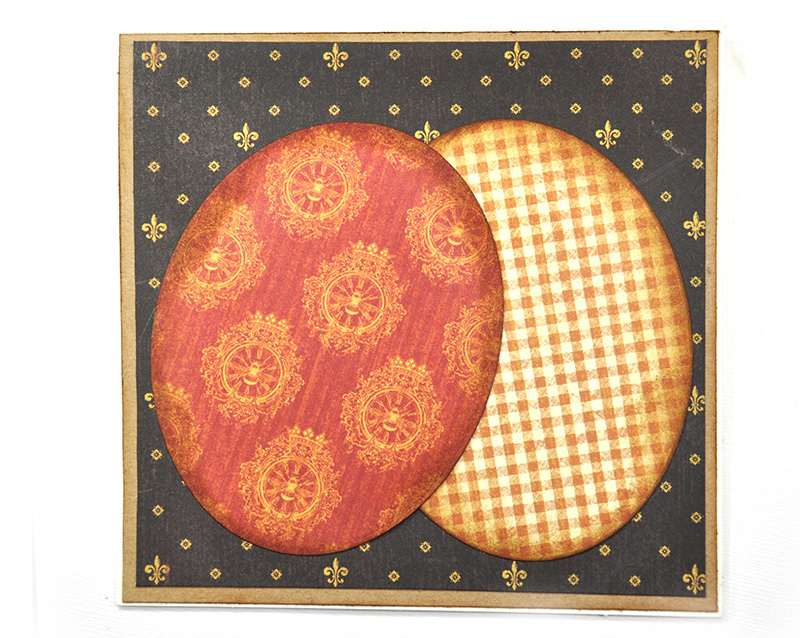 The next big smile maker comes from pairing pretty papers with fabulous dies. This gorgeous paper collection has been accentuated by using some dies from Spellbinders, shown below. Two products that need to be at the top of your "must haves" list. 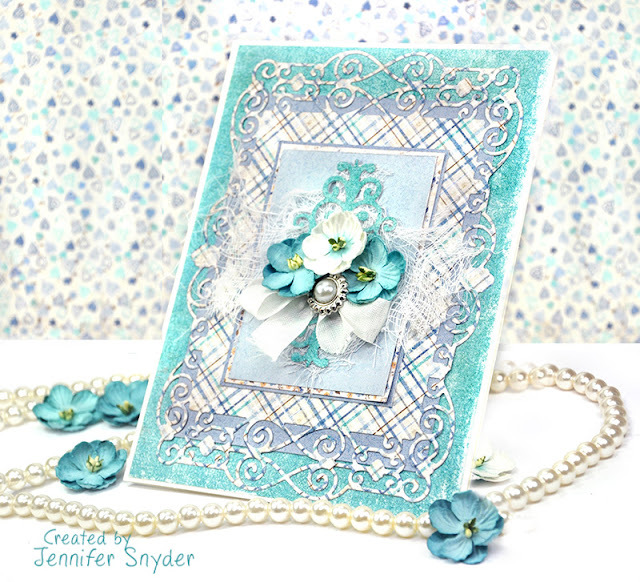 I wanted a graceful delicate card for an upcoming wedding. The color palette for this wedding is teal/seafoam so I picked out the perfectly matched papers and went to work creating from my heart. A little bit about the beautiful flower embellishments I selected. These are paper flowers from Petaloo by Floracraft - the Petaloo Flowers - Penny Lane Collection Forget - Me- Nots in Teal. You can shop for Petaloo flowers here and here. I absolutely love the color combinations in this collection. The next few photos are close ups and you can see how gorgeous the paper is. 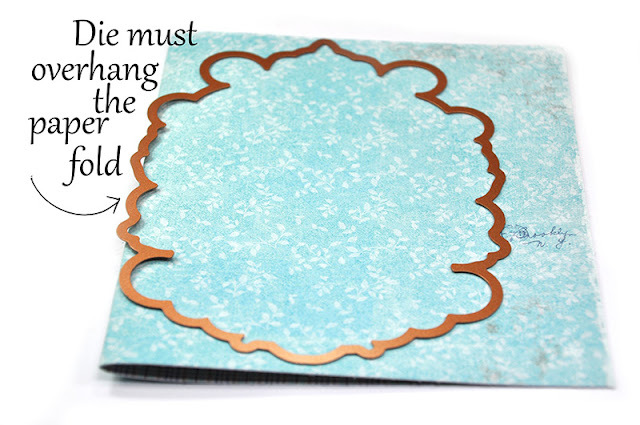 You can shop for Maja Design products here and you can find the collection here.